This show is actually a music glimpse of this weekend's New Haven Folk Festival (formerly the Eli Whitney Folk Festival). Highlighting the night was an in-studio performance and interview with Pat Humphries and partner Sandy Opatow, who now perform together as Emma's Revolution. These are two women deeply committed to the cause of social justice. They are imbued with a fierce determination to spread a message of hope and love to a world that is sorely in need of it. Pat Humphries - who has been called the "true spirit child of Woody Guthrie - is best known for her folk anthems such as "Swimming To The Other Side" and "Never Turning Back". 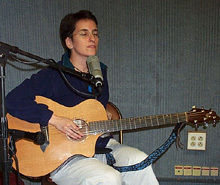 Sandy O., as she's known, has also enjoyed a solo career as a folk artist. The remainder of the show featured recorded selections from some of the artists appearing at the festival, including headliner Arlo Guthrie. Listen to the live portion of the show Note: Due to technical problems, only a partial recording is available. "If I Give Your Name"
"Swimming To The Other Side"
"Has Anybody Seen The Choir"